This is the start of the series digging into the blueprint for the VCP Foundation Exam. This post will deal with “Objective 1.1 Identify vSphere Architecture and Solutions for a given use case”. Let’s get started. Remote office/Branch Office Standard Adds VM capacity into existing Std, Ent, Ent+ system. Packs of 25 VMs. Feature set roughly equivalent to Std. Essentials Advanced Essentials Std plus: vMotion, HA, DP, vShield endpoint, vSphere replication. 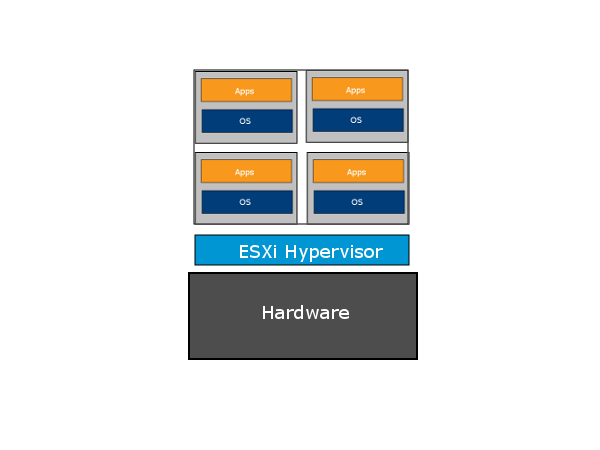 ESXi Hypervisor Free Basic Hypervisor. No central management. No advanced features. 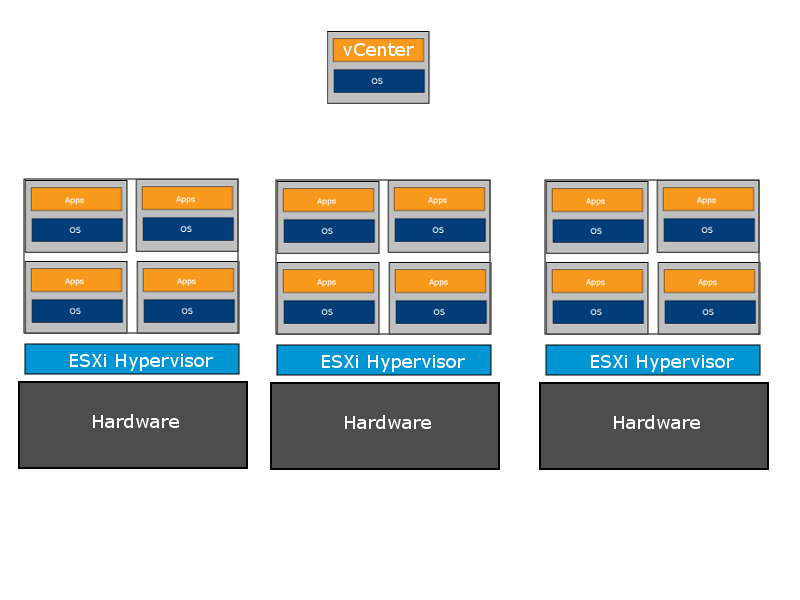 The hypervisor – not really a vSphere edition at all, and unable to connect to vCenter server. Included for completeness. Essentials – A reduced feature set, only usable on up to three hosts, designed for the SMB. Upgrade capacity is limited. ROBO (Remote Office/Branch Office) – Designed to add hosts in remote locations to an existing vSphere installation. 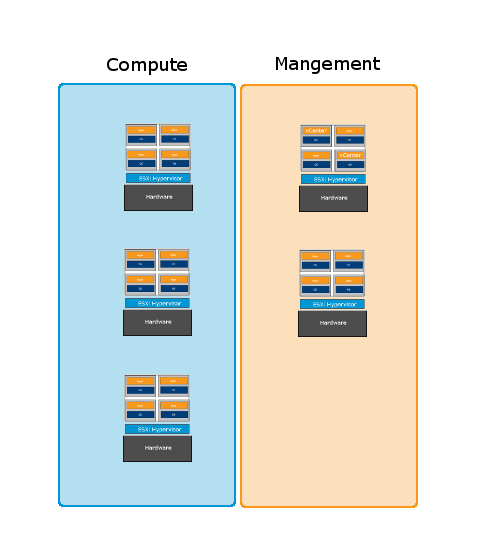 vSphere – The baseline for medium to large enterprise. A nice upgrade path from fewer to more features by licensing. Most additional products assume this as a base. Most documentation assumes this edition set. vSphere with Operations Management – Basically a way to purchase vSphere along with the vRealise suit to gain orchestration, insight and automation. In addition to the vSphere system with gives you the ability to virtualise, there are the VMware add in products that extend the functionality. Horizon extends vSphere into the Virtual Desktop domain. Site Recovery Manager (SRM) gives active/passive DR capabilities, with the ability to fail your virtual infrastructure to a remote location. vRealise gives operations management and insight, along with Orchestration. vCloud Suite gives the ability to create multi-tenant private clouds. NSX gives fine grained network virtualisation with distributed routing and fire-walling along with data protection. Airwatch allows Enterprise mobility and builds on Horizon. There are a few ways we can design our VMware infrastructure depending upon the constraints. These start simple, and get more complex, but the added complexity often has distinct benefits. For any given customer, a solution will usually fit broadly into one of these schemes, but I have seen situations where more than one has been implemented. This is the only solution we can use for the ESXi Free Hypervisor. There can be external storage, but this is not necessary. In this case we use a single ESXi host with no vCenter. This gives us the benefits of consolidating physical servers onto a single host and better resource utilisation. This system is harder to manage with multiple hosts, and does not scale well. There are no advanced features such as live migrations. I have used this in an instance where I needed a couple of low utilisation VMs at multiple sites, but didn’t need to manage them often, or worry about fail-over. This is the solution introduced in the Essentials Product line, and the simplest of Full Fat vSphere deployments. Here we introduce vCenter and Shared Storage, to gain the advantages of live migration, and manageability. The image below shows the architecture. Note that vCenter is shown as a Floating VM. This is because it can be either contained on one of the hosts (usual) or on a bare metal server (unusual). vCenter is also available as a windows application, or as a Virtual Appliance. This solution is more scaleable than the first solution we discussed, but the limit of 64 hosts per cluster means that is doesn’t scale as well as the final architecture we will look at. By including Management (i.e. vCenter) and usually DMZ (De-militarised zone, or “unsafe”) traffic into the cluster we have a single failure domain where failure of a host, or compromise of a single network affects the whole system. This is the standard SME solution that most businesses start out with. The constraints are loose enough that this is a good fit for a large number of clients. This is the most scaleable system available. This is used for cloud environments and large deployments, or when VDI is introduced. In this system the servers doing the work (Compute) are in dedicated clusters. The servers doing management and DMZ traffic get clusters dedicated to them. Servers holding VDI user sessions get dedicated clusters. There are usually multiple vCenter servers, one serving the Management cluster, one serving the compute clusters, and one serving the VDI clusters. This level of segregation makes the system very scaleable. Adding in new compute capacity is a modular process. The separate clusters also become separate failure domains. Finally, delegation of admin work is easier and more secure, so VDI admins can be kept away from Compute admin privileges and vice versa. The downside to this architecture is it’s complexity. The final architecture we will look at runs parallel to the others. It is possible to have multiple vCenters running in different data centres, and now to vMotion between them. This is new in vSphere 6.0. This means that vCenter traffic can be kept local to a DC and not transported across the WAN. Along with the usual slew of performance and scalability improvements, vSphere 6 has introduced new solutions that allow a wide range of systems that were not possible before. These are detailed below. A range of security enhancements have been made to vSphere, with the addition of account lockout and password complexity rules. Gives the ability for Horizon View to use hardware GPUs for guest VMs. This means that VDI sessions can benefit from full GPU acceleration for graphics intense workloads. This is either access to the GPU in a time-sliced fashion similar to how ESX grants access to the Host CPU, or in a direct 1 VM to 1 GPU fashion for direct GPU access that bypasses the hypervisor. As well as having the option of Windows install or Appliance install, the vCenter Appliance in vSphere 6 brings with it two different architectures. The first embedded runs a single machine with all services. The second – External – runs the PSC and vCenter rolls on separate machines. This allows for more flexibility and scalability. This also makes it easier to upgrade where there are other services using the PSC such as NSX or Horizon. Linked mode is now automatic if two vCenter servers are connected to the same PSC. This makes set up and maintenance much easier. vMotion between data centres is now possible, so long as the connection supports a RTT (Round Trip Time) of 150ms or less, vMotion between different vCenters is also available. This also allows a path to upgrade seamlessly from Windows based vCenter to the Appliance. The content library keeps a synchronised library of ISOs, updates and Templates making automated deployment much easier, and critically, centrally managed. Virtual volumes or vVols, allow fine grained control of the storage underlying VMs. They allow the use of per VM storage and make snapshotting and other management tasks easier. They also allow the underlying storage to advertise capabilities which vCenter can then take advantage of. This is done through the vSphere API for Storage. This has been a long blog post, and if you have stuck with it to the end, well done! It should have served to give you the tools you need to answer the final item on this section though. Determining the edition required depends on the customer requirements. Are they small enough that essentials with it’s three host limit is suitable? Do they need dvSwitch and so Enterprise Plus licensing? If you have the rest of this post covered, this section should be a breeze. With the release of vSphere 6, VMware have updated the exam structure as normal. This time there are a couple of interesting (to me at least) changes. This week it is VCP week and even though I am pretty certain that we have covered networking before, that was before we started recording these, so to remedy this omission we are repeating the exercise. We will be deal the Standard vSwitch, the Distributed vSwitch and cover the creation of portgroups and PVLANs, all good stuff and a major section of the VCP Exam. Even better we now offer international dialling numbers for several countries including the UK, Netherlands and Norway. As an aside: VMware has a Free VCP Voucher offer, check here for details. This session will be recorded and put up under the new “Brown Bag” section. Note: The VCDX Link does not work at present. Warning – REMEMBER Those of you that are VCP’s do not forget that you are under NDA regarding Exam questions, this session is not a Braindump exercise, but a real attempt at a focused study group. The exam was a significant improvement on the VCP 310 exam, it was a little more challenging and the profile was more to do with real environment questions rather than the how many vCPU’s can you have if it is a Thursday afternoon just before tea time type questions. So what is my advise for the exam, well the number one is use the blueprint as a guide for your revision, also also visit longy’s resource for some very good guidance and test questions. and play with the environment. There are certain question you can only answer if you have seen the products. VMware is allowing participating candidates who fail a VMware Certified Professional on vSphere 4 exam (exam code – VCP410) to have a free re-take. Visit www.PearsonVUE.com/VMware/Upgrade for more details. Click Here to enroll in the 2nd Shot/Upgrade Program.